For as long as we can remember, designated groups have been disadvantaged economically by the wage gap. Women make on average 70 cents per dollar made by men – for the same work. The deficit only increases for women from different ethnic backgrounds. This imbalance of equity has been available information for years, but little has changed. Ontario has taken Canada’s first big swing at the glass ceiling by implementing The Pay Transparency Act. As this new legislation gets underway, businesses are left wondering how their bottom lines will be impacted. Encourage employees/candidates to bring complaints forward to the Ontario Labour Relations Board if they believe there has been a violation of the Act. Disclosure measures for pay transparency will begin with Ontario’s Public Sector. In 2020, the new legislation will apply to all employers with over 250 employees. Come 2021, the Act will extend to all companies with over 100 employees. This will cover approximately 70% of workers in Ontario and will shine a light on the majority of businesses, setting the standard for all workplaces to follow. How Will The Pay Transparency Act Affect My Business? The market will likely influence compensation structure more than the chosen candidate will, and companies will make most compensation-related decisions prior to hiring. The Act will prohibit businesses from hiding salaries. This could create the concern of companies losing their competitive edge in hiring by having compensation information at the forefront of market offerings. Financial penalties will become a reality for companies who are unable to produce the required documentation and pass inspections. 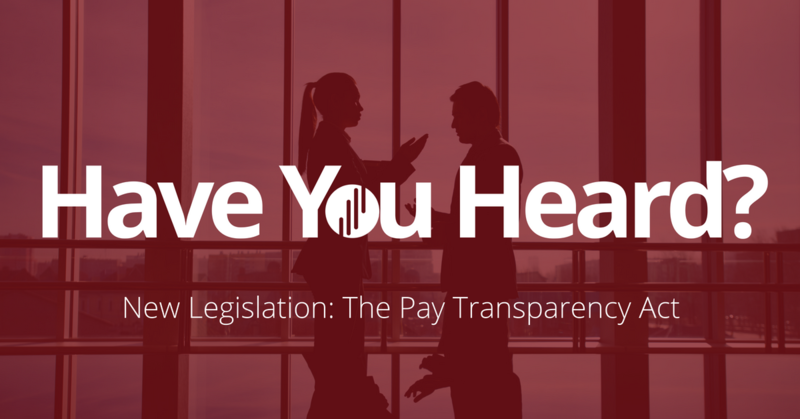 A public annual pay transparency report will showcase how employers compensate their employees, which could impact company reputation, customers, employer brand, and ultimately profitability. Equal pay and inclusive practices are transitioning from an initiative spearheaded by HR to a tool for survival in the market. In a world that shares information fast and furiously, employers know the importance of maintaining a positive reputation. Will This Legislation Actually Solve Problems? From part-time jobs to fields with lower pay, there have always been systemic barriers to women getting ahead economically. The high cost of childcare forces many women to stay home and care for children instead of re-joining the workforce. Negotiation is another big factor for the wage gap. Historically, designated groups negotiate compensation less frequently. Societal norms and gender stereotypes make it intimidating to break the mold. Although this new legislation offers tools and resources, it won’t provide the roadmap to refining negotiation styles. One final criticism of Ontario’s Pay Transparency Act is that the slow rollout will limit real impact. Critics feel that 100 employees or more is too large of a criteria, and propose that employers with 10 employees or more should abide by the legislation as well. Although the Pay Transparency Act will cause additional work for Ontario employers, many consider equality to be worth it. We see businesses continuing to focus on inclusion at all levels of their business, including compensation practices. But status and monetary differences between groups will likely continue due to ongoing systemic limitations, like access to affordable child care. Despite criticism, Ontario remains the first province taking tangible steps towards a future where a dollar means a dollar – for everyone. Who’s next? Make sure your organization is up to date and compliant with current legislation!